People react to the decision of the Constitutional Court over the impeachment of South Koeran President Park Geun-hye in Seoul, South Korea, March 10, 2017. The South Korean Constitutional Court has voted unanimously to uphold the impeachment of President Park Guen-hye. 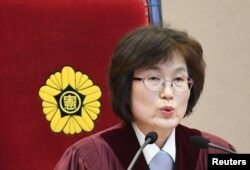 Acting Chief Justice Lee Jung-mi’s reading of the ruling from the Constitutional Court in Seoul Friday was broadcast live by national media outlets. “We believe that there are greater benefits by expelling the respondent from the office. Therefore with a unanimous vote of the justices we announced upholding (the impeachment.) The respondent President Park Guen-hye is expelled. South Korean acting Constitutional Court's Chief Judge Lee Jung-mi during final ruling of President Park Geun-hye's impeachment at the Constitutional Court in Seoul, South Korea, March 10, 2017. All eight of the Constitutional Court justices endorsed the National Assembly motion, passed in December with more than the two-thirds majority support needed, to remove Park from office on charges of corruption, misconduct and negligence. The court cited as “grave violations” of the constitution the allegations that Park colluded with her long-time friend Choi Soon-sil to extort Korean conglomerates to donate more than $69 million to two dubious foundations. Choi was alleged to have a “cult-like” influence over Park and control over her staff, even though she had no official government role. “These violations undermine the rule law and a representative democracy,” Lee said. Park was also reprimanded for being uncooperative and evasive in the investigations, and attempting to prevent the legislature from acting as a “check and balance” on executive power. Other charges the justices found troubling but did not constitute grave violations of the constitution include allegations of negligence related to Park’s extended absence during the 2014 Sewol Ferry disaster. The Constitutional Court also clarified that its ruling was focused on the legitimacy of the National Assembly action to oust the president, and not on criminal guilt or innocence. FILE - South Korean President Park Geun-hye speaks during an interview at the Presidential Blue House in Seoul Sept. 16, 2014. 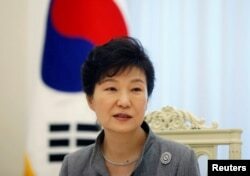 The 64-year-old Park now becomes the first democratically elected president of South Korea to be removed from office. She is the second president to go through the impeachment process. In 2004 President Roh Moo-hyun was ousted by the legislature but was reinstated by the court two month later. In Myung-jin, interim head of Park’s conservative Liberty Korea Party said his party will respect the “grave value of constitutional law and democracy” and will “humbly accept the decision” of the court. “From this moment, the Liberty Korea Party is not a ruling party anymore,” In said. Choo Mi-ae, leader of the opposition Democratic Party of Korea, hailed the court ruling as a historic triumph of people power and democracy over an entrenched government and corporate monopoly. “The world will record the great fight and victory of our people as new history of democracy,” Choo said. The impeached president has repeatedly denied the charges against her, maintaining that the actions she took were in the national interest and insisting she never personally benefited during her 18 years of public service. She also offered a number of public apologies for not being aware that some of her close associates may have been involved in some wrongdoings. Park is the daughter of a military ruler who led the country for 18 years before being assassinated in 1979. The South Korean military has been put on high alert following the impeachment ruling to deter North Korea from taking advantage of the political turmoil in the country. Park was suspended from her duties following the impeachment vote in December but continued to reside in the Blue House presidential residence. She must now move out as soon as possible. Park won’t vacate the presidential Blue House on Friday as her aides are preparing for her return to her private home in southern Seoul, according to the Blue House. Park wasn’t planning any statement on Friday, it said. Under the constitution, Acting President and Prime Minister Hwang Kyo-ahn must schedule a presidential election with 60 days. Opposition leaders have called for the polices of the impeached president to be put on hold until a new leader is elected. The Democratic Party of Korea has also called for the deployment of the controversial U.S. THAAD missile defense system to be delayed. China’s strong opposition to THAAD and reports of Beijing retaliating against Korean companies have sparked increasing concerns in South Korea. Parts for the anti-missile battery, however, have already begun to arrive in South Korea and the system is expected to be fully operational as early as April. Many progressive leaders want to pursue a less confrontational approach to resolve tensions with North Korea over its nuclear program. In the upcoming election, conservatives are expected to make national security a key issue and will try to contrast liberal pro-engagement policies with their hardline positions on taking increasing defensive measures, maintaining the close alliance with the U.S. and increasing punitive measures on the Kim Jong Un government. While in office, the president was immune to prosecution, but Park could now face criminal charges. Earlier this week a special prosecutor, appointed to investigate this corruption scandal, accused Park of wrongdoing on several charges, including a bribery conspiracy implicating the Samsung Group. Samsung Group Vice Chairman Lee Jae-yong and other company officials were indicted for donating $37.19 million to the Choi-run foundations in exchange for government help on an important merger for the company, and could face up to 20 years in prison if convicted. Choi and a number of presidential aides are facing similar charges and prison terms for their roles in the influence peddling scandal. Because she was impeached, Park will also lose most post presidency benefits and privileges including a generous pension, health care and administrative support. Police surround demonstrators during a protest in front of the Constitutional Court in Seoul, South Korea, in this image from video, March 10, 2017. Outside the court, thousands of Park supporters and opponents held rival demonstrations. More than 21,000 police were dispatched to prevent violent clashes between these groups. Traffic near the court has been shut down. Two people later died during the protests. The anti-Park protesters celebrated the impeachment ruling. Since October there have been weekly massive, peaceful protests across the country demanding the president step down over the corruption scandal. The demonstrations, along with Park’s approval rating of less than 10 percent, helped pressure the National Assembly to act. A recent survey poll found that 79 percent of the South Korea public supported an impeachment ruling. The presidents’ supporters reacted with outrage and there were incidents of protesters scuffling with police. In the last month, increasing numbers of conservative supporters of President Park have been organizing counter demonstrations to denounce the impeachment as tyranny of the mob and an illegal reversal of a democratically held election. The court was intent to make its ruling by Friday before judicial term limits reduced the normally nine-member body to seven justices. 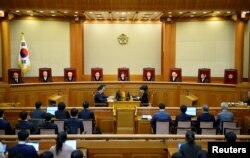 The South Korean Constitution requires at least six justices concur for an impeachment motion to be upheld. But Chief Justice Park Han-chul was forced to step down in January when his term ended, and Monday will be the last day of Justice Lee Jung-mi’s term. During the impeachment process justices’ terms cannot be extended and no new judges can be appointed.